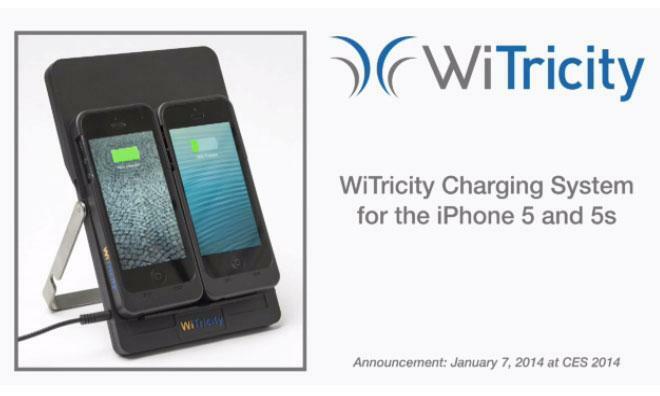 Short-range wireless power for portable devices came one step closer to production Tuesday with WiTricity's unveiling of an iPhone-targeted reference design for the group's resonant energy transfer system. Like other wireless charging options for Apple's handsets, WiTricity's demonstration system consists of a plastic sleeve that envelops the device and a charging hub that acts as a sort of wireless power "base station." WiTricity's resonant inductive coupling technology, however, provides several benefits over competitive systems. Consumers using charging platforms based on WiTricity's technology would not need to place their iPhone directly on the charging pad, for instance, merely in its immediate vicinity. Power transmission is not affected by materials like wood or glass, meaning that the pad could be mounted underneath a table or desk to provide power for devices resting on the top. In addition, WiTricity's proof-of-concept can charge multiple devices from a single coil. Traditional direct induction systems —like those AppleInsider profiled last month— require a separate coil for each device, increasing the size and cost of the charging pads. "Our team is thrilled to introduce the first wireless charger that works over distance," WiTricity chief Eric Giler said in a statement. "We've seen the transformative nature of our foundational highly resonant wireless power transfer technology in the automotive, medical and military fields, and now plan to change the game in consumer electronics." WiTricity's system is similar to wireless power approaches previously patented by Apple, in which the company suggests turning existing desktop devices, such as an iMac, into resonant energy transformers. "In this way, a realistic and practical approach to wireless transferring useable amounts of power over distances suitable for limited applications can be realized," the Cupertino company wrote in one such filing.